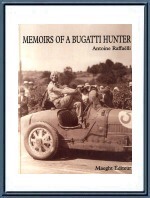 Memoirs of a Bugatti Hunter - Antoine Raffaëlli - Maeght Éditeur - ENGLISH - 1997. 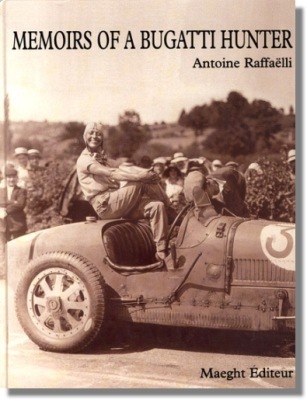 The author tells his life during which he discovered numerous Bugatti, mostly for Fritz Schlumpf and his fantastic museum, today Musée National de l'Automobile in Mulhouse (France). The story of these discoveries is astonishing, and well written. Second part of the book details all 35 and 37 Types that the author has known, with the history of every chassis number. When published, this book made creak many teeth, some authentic renowned Bugatti being known here as destroyed in race, photos in the support ! To note very beautiful and numerous photos of the era, often unknown. Published by Maeght éditeur - Paris - France - 1997.